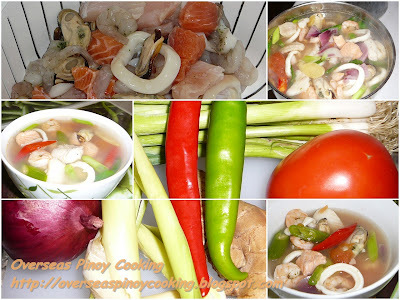 Pinoy Mixed Seafood Soup, I have been thinking how to cook the fresh mixed seafood that I have bough that is intended for a seafood marinara. I definitely wanted a Pinoy dish perhaps a soup dish, the choice was sinigang or tinowa a Visayan fish soup dish flavored with lemongrass and ginger. The mixed seafood that I have includes squid and mussels which I tough was not appropriate for sinigang, so I settled for a tinowa soup. This is not a new recipe as to my knowledge I know in Cebu they have tinowa with mixed seafood that even include crabs and mussels. The soup dish came out great I would not hesitate to recommend it to every one, definitely our Visayan readers would love this soup dish. In a saucepan boil 5 to 6 cups of water, when it start to boil add in the lemongrass, ginger, onion and tomato. Simmer for 3 to 5 minutes. Now add in the mixed seafood, add in the squid and shrimp last, then add in also the leeks and hot chili peppers. Season with salt to taste. Simmer for another 3 to 5 minutes. Do not overcook fresh seafood. Serve with white steamed rice. I myself have been planning to make one, but it requires a lot of seafood ingredients. Just watch for it should I manage to source all the required ingredients I will make one soon.